Op donderdag 15 oktober is de Vondst van het Jaar 2015 gepresenteerd door prof. dr. David Fontijn en dr. Sebastiaan Knippenberg bij de Faculteit der Archeologie aan de Universiteit Leiden. De vondst is afkomstig uit West-Friesland en dateert uit de Bronstijd. 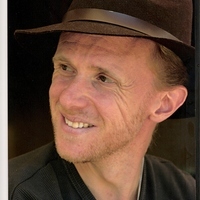 David Fontijn is geïnterviewd en de onthulling van de vondst is gefilmd door regionale en nationale televisieploegen. 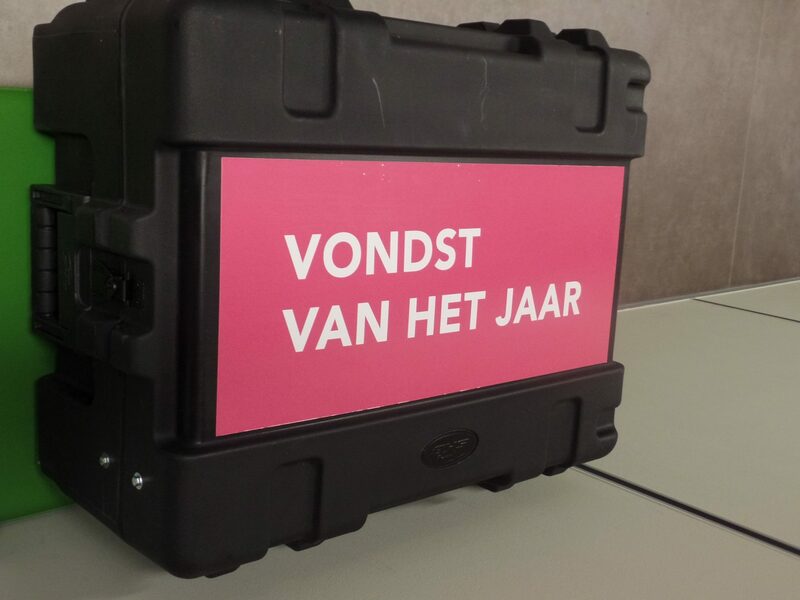 Bekijk hier foto’s van achter de schermen en van de onthulling van de vondst! Meer foto’s zijn te vinden op Instagram. Hier kun je de televisie-uitzending van RTVNH bekijken en hier het artikel van de NOS. 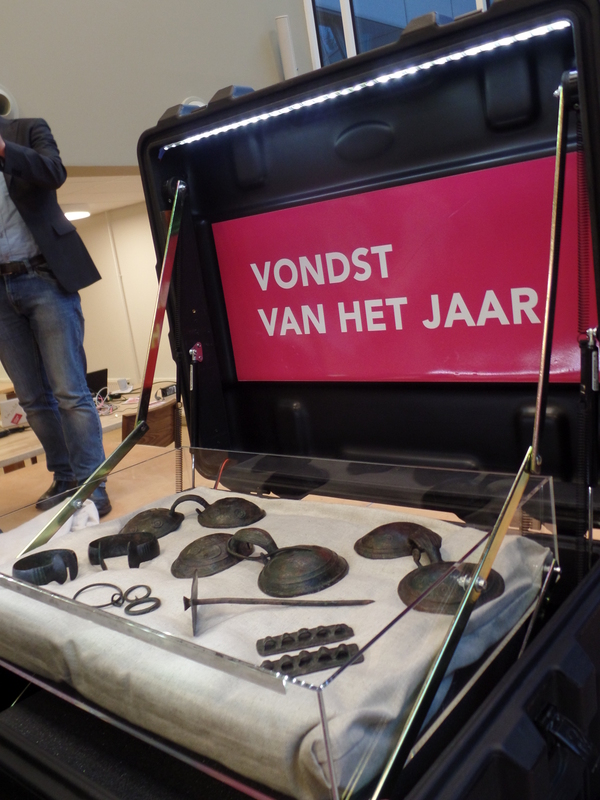 On Thursday the 15th of October, the Find of the Year 2015 was presented by prof. dr. David Fontijn and dr. Sebastiaan Knippenberg at the Faculty of Archaeology, Leiden University. 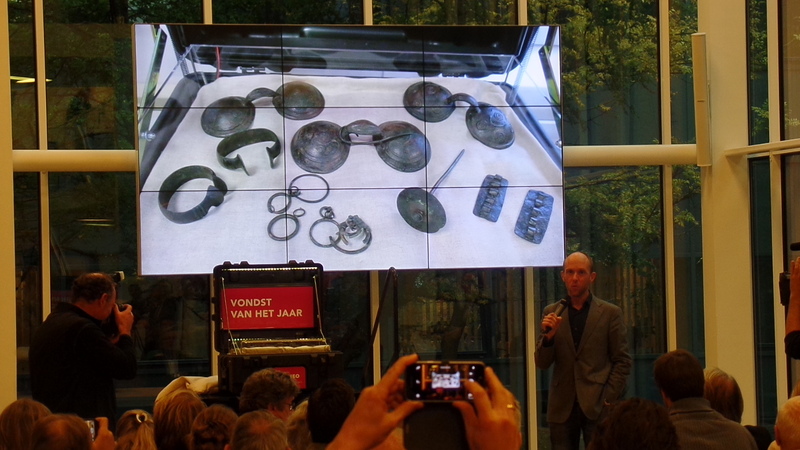 The hoard find comes from West-Frisia and dates to the Bronze Age. 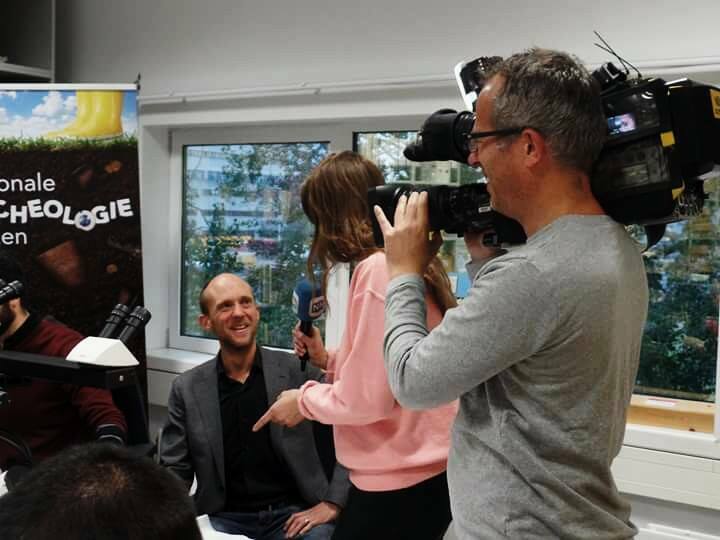 David Fontijn was interviewed and the presentation of the find was filmed by local and national television crews. Here are some behind-the-scenes photos and photos of the presentation of the find. More photos can be found on Instagram! Watch the news item on regional television here and read the article in the national news here. Wat zou er in het koffertje zitten? 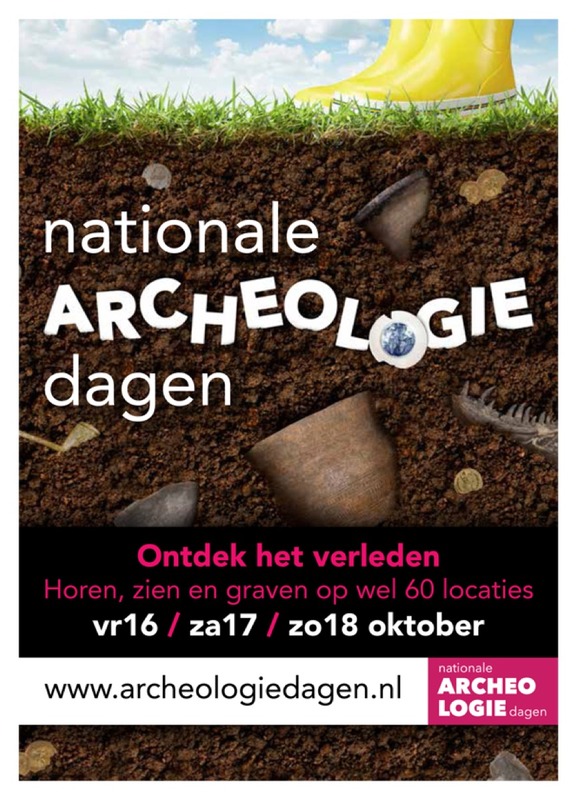 Op donderdagmiddag 15 oktober zal de Vondst van het Jaar onthuld worden bij de Faculteit der Archeologie aan de Universiteit Leiden! Houd de website in de gaten voor meer informatie. Who knows what’s inside the suitcase? On Thursday the 15th of October, the Find of the Year will be revealed at the Faculty of Archaeology at Leiden University! Stay tuned for more information. Sabrina studied Pre- and Protohistory at Kiel University (Germany) specializing in Neolithic house structures, megaliths and material culture. The aim of Sabrina’s research within this project is to identify a potential correspondence between the rise and fall of watery depositions and dry-land depositions, the inner structure of depositions, as well as to reveal whether objects deposited in dry lands represent a practice steered by ideas and motivations contrasting from those of river depositions. 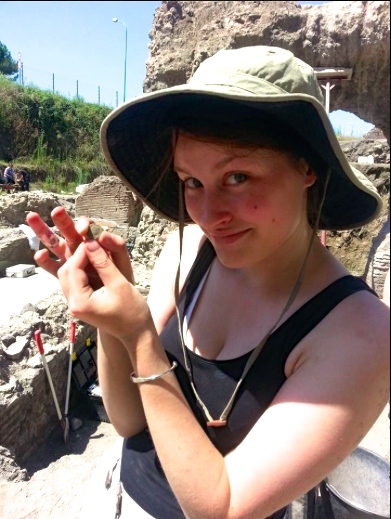 Leah unearthed a passion for Archaeology & Anthropology at the University of Bristol (UK) and later pursued this at the University of Cambridg e (UK) where she specialised in the material culture of the British Bronze Age. During the Economies of Destruction project, Leah will be focusing on the region spanning from Southeast Britain to Northwest France and attempt to investigate the relationship between these two landscapes across the English Channel. Leah also hopes to examine more deeply the complex tradition of Early Bronze Age metalwork deposition in these areas, which includes hoards, burials, depictions and single finds. Marieke studied Archaeology at Stockholm University (Sweden), specialising in the Prehistory of Northern Europe and Osteoarchaeology. Within the Economies of Destruction project, she will study the rise of metalwork depositions in West Denmark (Jutland), North Germany and the Northern Netherlands. One of the aspects she will investigate is the differences between deposition practices in watery places and in burials in the region.